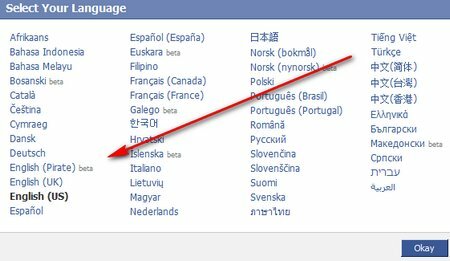 My good friend Kelly told me about this “Facebook Secret” and I have to admit it’s hilarious AND I’m going to share it with you (in case you haven’t found it yet)… Facebook has allowed a BETA language called English (Pirate) and it changes quite a bit of the Facebook text from standard English to Pirate “lingo”. First scroll all of the way down to the bottom of yer “Home Port”. 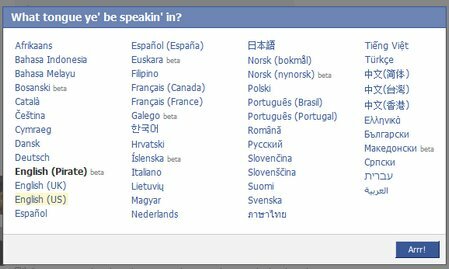 Select English (Pirate) Beta from the popup list and click OKAY! That’s it! Now ye be a Facebook pirate, Arghh! Hope you have fun with it… I did.